Kaliya Krishna dasa, also known as Kala Krishnadasa, was a devotee of Nityananda Prabhu, and lived in Akaihata, India in the sixteenth century. It is described that Kaliya Krishna dasa, in a previous life, also participated in Krishna's pastimes as a cowherd boy in Vrindavan. The biography of Chaitanya Mahaprabhu's early life, the Chaitanya Bhagavata, says, "One will surely attain Shri Chaitanya and Shri Nityananda simply by remembering Kaliya Krishna Dasa." Kaliya Krishna dasa was fully devoted to the service of Nityananda Prabhu, and had no worldly cares. 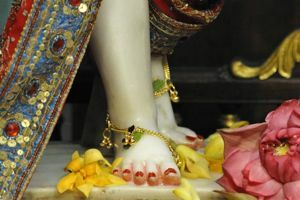 Image is a photograph of the feet of the Deity of Nityananda Prabhu, at the Radha-Gopinatha temple in Chowpatty, Mumbai, India.